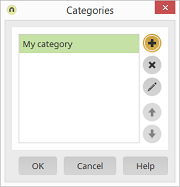 Opens a dialog for creating a new category. The currently selected category is deleted from the list. Opens a dialog where a category can be modified. With the arrow buttons, you can modify the order of the categories in the browser.